Life is an exciting adventure for Enam Ul Haque. Not one to fall prey to the ennui that sometimes has one in its fierce grip, Enam has successfully demonstrated that it is possible to juggle several interests, in his case bird-watching, trekking and photography which go in tandem with his role as Managing Director of GQ Industries Ltd. "There is no clash between my varied interests. In fact, life is more colourful because of my interest in many different things, especially nature," says Enam. Just back from a three and a half day trip to the idyllic Nijhumdwip where he had spent New Year's Eve with a group of outdoors enthusiasts, he is off again for another weeklong sojourn. This time his wanderlust takes him and a small team of bird watchers to North Eastern Bangladesh, more particularly to the Haors (lakes) of Sunamganj. In the following weeks he travels to Sirajganj, Gaibandha, Natore, Faridpur, Feni, Chittagong and Khulna for the bird census. Here Bangladesh Bird Club, founded by Haque, will undertake the Asian Waterbird Census -- an annual event eagerly awaited by bird watchers. Among the birds that will be counted are egrets, herons, waders and ducks. Other teams have gone out to locales such as Haila and Hakaluki Haors in Central Bangladesh (Srimongal and Kulaura) and coastal islands such as Bhola, Monpura, Hatia, Nijhumdwip, Shahjalal and Dhal-char. There are about 40 sites where the bird watching enthusiasts go out to undertake a census in January and February every year. 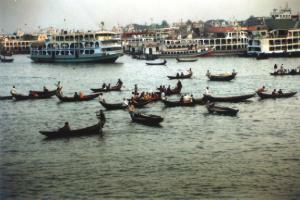 A shot of Sadar ghat from where Enam started for his Nijhumdwip trip. The Bangladesh Bird Club, which was formed in 1996, seeks to promote bird watching by taking regular trips to forests in Modhupur, Srimongal, Moulvibazar and Sunderban beside those 40 sites. Enam, the national coordinator of Bangladesh for the Asian Waterbird Census, organises most of these bird watching tours. "Our aim is to protect nature and build environmental consciousness," says Enam. The star attraction for bird watchers like Haque is the arrival of 200 migratory species from the Himalayas, Nepal and Russia and a small number from Europe. A major cause of concern for Enam is the indiscriminate hunting of the guest and local birds like geese, heron, egrets and ducks. As he states, it is necessary to protect these birds for future generations as well as to generate public awareness to prevent their extinction. One of the bird watching bonuses for Haque and his team this winter is the sighting of the crested kingfishers in a remote hill in Bandarban. The birds were seen during a week long tour of the Sangu and Matamuhuri reserve forest. There are around 12 species of kingfishers in the South Asian subcontinent and they are all recorded before in Bangladesh, but for the crested kingfisher. Photography is another passion. He says that he is a self-taught photographer -- in the same manner that he has learnt bird watching, trekking, snorkeling and scuba diving. Starting photography from 1994, he has held 15 major exhibitions in Bangladesh and other countries such as Indonesia, Iran and Singapore. His lens captures the splendour of nature, especially wild animals and ethnic people living in remote areas. Among his eye catching photographs are those bearing titles such as Morning Chill that depicts a boy shivering of cold and others of sunsets and sunrise. Then there are others titled Trusting Nature, Alphabets and Sindbad. His photographic expositions have won acclaim both in his country and overseas. In 1996 he received a Certificate of Merit at the Nature-Photo Contest in India. 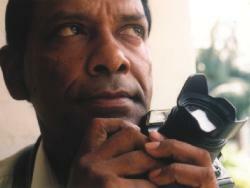 Enam is a life member of the Bangladesh Photographic Society. Haque also has a flair for the printed word. He writes regular columns in Womun, the monthly newsletter of UN ladies voluntary organisation and Digonto, the in-house journal of Bangladesh Biman. His essays on birds and bird habitat are published in dailies such as the Jonokontho, Prothom Alo, The Daily Star and The Independent. He won the Federation of the Environment Journalists of Bangladesh (FEJB) award for the best newspaper article on nature in 2000 for an article in The Daily Star on migratory birds. Because of his close association with nature and birds, in particular, Enam is a life member of the Bombay Natural History Society, the famed organisation once headed by the great Indian ornithologist, Dr Salim Ali. He maintains his long standing friendship with Dr Asad Rahmani, the president of the Society and SA Hossain, an avid bird expert who studied under Dr Salim Ali. Asked to choose between his diverse interests, he says he would definitely give first place to travelling. So far Haque's expeditions have been to diverse locales such as hills of Bandarban district, Andean mountains in Chile and Irawaddy River Valley in Myanmar. The most noteworthy journey, he reminisces, was to the icy continent of the Antarctica where he went to watch and photograph penguins in January/February 1997. Accompanied by a team from countries such as USA, UK, South Africa, Italy, Malaysia and Japan, Haque drew the distinction of being the first Bangladeshi to set foot on the Antarctica. At the moment Enam's Trekking Club has its hands full. He formed a group, Bangladesh Everest Team No 1, and initiated mountaineering for the first time in the country. In October last year, the Bangladesh Everest team sent a member to the Nehru Institute of Mountaineering in Uttarkashi, India and in March will send four more including a woman to the Himalayan Mountaineering Institute in Darjeeling, also in India. This group, along with three others lead by Enam, will go in May to the Everest Base camp in Nepal. In September, Enam will lead a team to the peak, Jogin 1, a Himalayan Peak in India. "This will prove very exciting because it is the first climbing of a Bangladesh tea," says Enam. Haque received the call of the wild when he was a mere boy. Growing up in a village called Hijlabot in Kushtia, he recalls the presence of leopards in the wilderness. "Every year the villagers would kill the leopards because the latter carried off the cattle. Now there are no jungle cats leave alone other wildlife in my old village," reminisces Haque. He became even more of an outdoor person at the age of 12. He recalls the exhilaration of getting of his cycle and pedalling off a road leading to a village near Faridpur where the family had moved from Kushtia. However, this exciting adventure turned scary when at sunset he realised that he was lost and would have to take the villagers' suggestion of spending the night with them. His disappearance naturally caused agitation in his family but the next day the villagers saw him safely home. His father, Yusuf Ali, was at this time working with the Public Works Department (PWD); later, he, on his retirement, became a businessman. Growing up in Hijlabot with pets such as dogs, cats and birds, Haque remembers his parents as animal lovers. For 30 years he kept birds such as doves and pigeons in cages. However when he developed an interest in bird watching, he released his caged pets. "Now I watch wildlife in its own habitat," says Haque. He also underwent a significant change in mindset. "I got hooked to meeting new people, going to new places. I would take my cycle and pedal off to new neighbouring places such as Magura, Jessore and Rajbari,"he says. As he explored new frontiers in Bangladesh and abroad, Enam realised that he was innately different from other people. "Most of my friends spend far more than I would on expensive holidays, hotels, clothes, food, house and furniture. Most of my activities are inexpensive since money required for a trekking or a nature-expenditure is still insignificant."